NGC 1275 is a galaxy that basks in the sizzling heat of X-rays emitted by its many sister galaxies in the Perseus galaxy cluster. 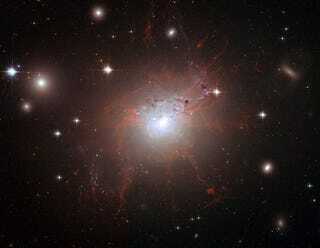 Not only does NGC 1275 have a supermassive black hole at its center, like any self-respecting galaxy would, but it also exhibits a very rare trait. Those pale purple tendrils of light you see are actually cooled gas that's been ejected by the black hole at its core, and their tentacley shape is caused by the magnetic fields connecting NGC 1275 with other local galaxies. This is a recent image taken by the Hubble Telescope, and it tells us a lot about galactic behavior. These tendrils have been a problem for astronomers: they're very narrow (only a couple of hundred light years wide), have masses a million of times that of the Sun, and should fall apart rapidly (they're blasting out into hot gas which should disrupt them, they're massive enough to collapse under their own weight to form stars, and tides from the galaxy itself should shred them). Yet they seem at least semi-stable, lasting for hundreds of millions of years. What holds them together? Turns out it's that old standby, magnetism. Recently released Hubble images (like the one above) have given astronomers insight into the structure of these tendrils. Hubble's hi-res view shows details previously unseen in the tendrils, allowing astronomers a better view and the ability to determine the magnetic strengths needed to hold the tendrils together against the forces that would rend them asunder.